Take our motor launch from Cap's dock located next to Lighthouse Point Yacht Basin & Marina (8 miles north of Fort Lauderdale). To reach Cap's dock turn east 2 blocks north of Copans Rd & US-1 (N Federal Hwy) at US-1 & NE 24 St. Follow the double lines and signs on the curvy road as you go through the residential area toward the Yacht Basin/Marina. EXIT I-95 COPANS RD in Pompano Beach [exit 38 -old exit 35- from Miami 38 A - old 35 A- from Palm Beach]. At Copans & US-1 Pompano Citi Centre - (Pompano Fashion Sq. Mall) turn LEFT onto US-1. Go north on US-1 two blocks to the traffic light at NE 24 St.
You are going to be driving on a curvy road thru a residential area approx. 1 mile toward the Yacht Basin/Marina. The curvy road to Cap’s Dock changes names several times before reaching our dock. The only roundabout (traffic circle) on Lighthouse Drive is about midway. Several directional signs (CAP’S PLACE–YACHT BASIN) are along the way. The first sign is approx. 3/10 mile from U.S. 1 on N.E. 24th Street (also called Lighthouse Drive). Bear left at the first fork in the road on N.E. 24th Street (Lighthouse Drive). Continue north on what is now N.E. 22nd Ave (also called Lighthouse Drive). Bear right as you approach the roundabout (traffic circle). Slow for the first of two speed humps. At the roundabout (traffic circle) - where Lighthouse Drive meets Marina Drive - go basicly straight thru - exiting at the first opportunity. Continue going east on what is now N.E. 27th Street (also called Marina Drive). Slow for the second speed hump (which is on N.E. 27th Street - also called Marina Drive) and continue east. Go east about seven houses and then bear left again onto N.E. 26th Ave when you reach a fork in the road at a small triangular park called DIXON AHL PARK. N.E. 26th Ave curves around to N.E. 28 Ct. and our dock is on the left just before the two red and white "do not enter signs". Our Dock is at 2765 N.E. 28th Court. See small black and white Map below. Cap’s has private parking at our dock. Public parking for 150 cars is available for Cap’s surrounding the Townhouses at the Yacht Basin/Marina. Between our dock and the Yacht Basin/Marina is an area shaped like a large square donut called Tillotson Square. Brightly painted "Key West Style" Townhouses are in the center of the Square. The "donut hole" or center portion contains the private Townhouses and the area surrounding the center portion ("donut hole") on all four sides are Public parking area for 150 cars. 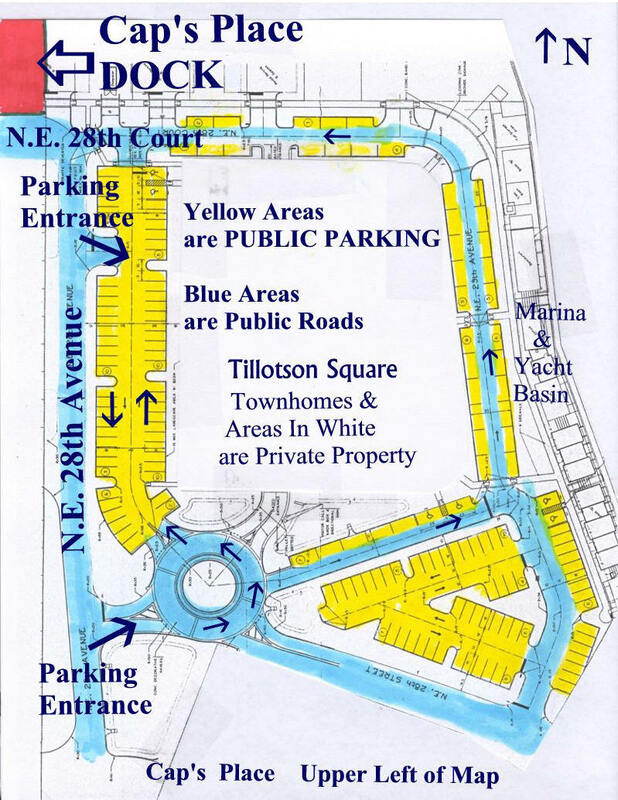 2nd map (in color) is a detailed map of the 150 car Public Parking areas which surrounds all four sides of the brightly painted 3 story "Key West Style" Townhouses at Tillotson Square at the Lighthouse Point Marina. The 150 parking spaces surrounding the 3 Story "Key West Townhouses" may look private, but it is PUBLIC parking. Look at the 2 detailed maps below. The closest entrance to the public parking lot is about 125 feet Southeast of our lot - across the street at an diagonal angle from our parking lot. Immediately next to our parking lot - on the EAST side - is a small PRIVATE parking lot for the boats docked at the marina. Do not park in any private parking areas. To locate the PUBLIC parking areas - look to the SOUTHEAST of our parking lot for the two red and white "do not enter signs" - about 75 feet south [right] of those signs you will see one of the entrances to the public parking. The portion of the public parking located closest to our dock may appear like it is private parking because it is behind low hedges - but look for a small Public Parking sign at the entrance to the parking area. The area of the public parking which is closest to our dock is located next to the 3 story "Key West Style"Townhouses behind a row of low hedges between the street and the Townhouses. Look for the 3rd Townhouse from the "do not enter signs" (painted bright blue) to find the closest entrance to the Public Parking. The colored map which follows show the public parking area in greater detail with the public parking highlighed in yellow. There is a second traffic circle at the marina - don't confuse it with the roundabout (traffic circle) located on Lighthouse Drive. Cap's Place is OPEN YEAR ROUND from 5:30 p.m.